Audi has revealed its latest, and most mainstream electric concept yet: this is where it gets very real. 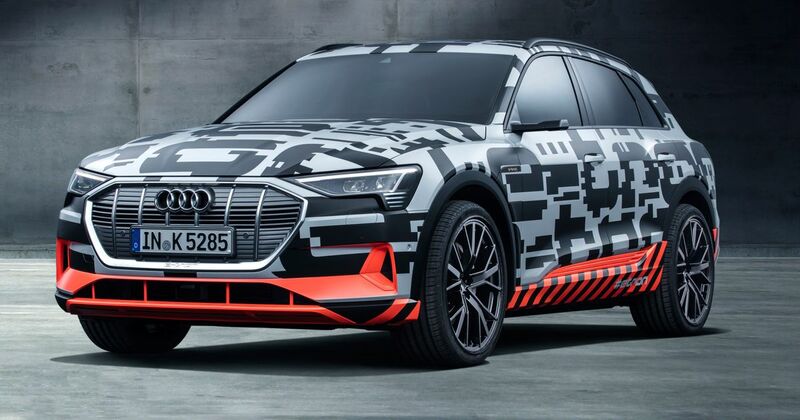 The e-tron crossover has appeared in action around Geneva before stepping up to the Audi stand at the city’s annual motor show. One of the lightly-camouflaged test mules was reportedly giving rides to journalists around the city, and the liveried-up concept obviously won’t have hurt the company’s brand-building exercises. We still don’t have full details, but we can give you some insight into the high-riding, low-roof five-door. Space and comfort are claimed to be on a par with one of Audi’s ‘luxury class models,’ although we’re left guessing as to whether that means the A4 or the A6. This model, with few or no changes, will enter production at the end of this year. Almost 250 prototypes will in the meantime complete a testing programme covering a target of over three million miles of real-world driving – equivalent to 125 linear trips around the world. The e-tron is compatible with rapid chargers up to 150kW, so should be able to refill to 80 per cent charge in less than half an hour. When topped-up to 100 per cent, a real-world driving range of 300 miles is the claim. That’s about the same as a lot of petrol cars. Audi is working on other electric cars, with the aim of having two more in production by 2020. The flagship sports car is still a possibility in the long term, but the next confirmed models are a five-door executive Sportback and a ‘compact’ car, which we’d assume to be an electric A3.